Those with a passion for law, justice and keeping the peace may find attending criminal justice school in Idaho leads to a rewarding career experience in a state with a low, yet ever increasing crime rate. The FBI reports Idaho’s overall state crime rate is low compared to the rest of the country, but the Idaho State Police reported an increase in overall crime in 2015. Criminal justice schools in Idaho train students to work in various legal and protective fields, as criminal investigators, law enforcement officers, court clerks and judges, paralegals and more. Learn more about the education and training opportunities, possible careers and the places Idaho’s criminal justice school grads go to work after graduation below. Students researching criminal justice schools in Idaho can find the most important information on each school in one place with the School Spotlight summaries below. 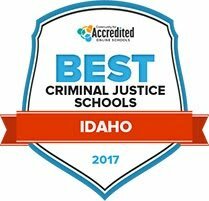 With broad, school-wide information and program-specific details collected together, these spotlights can give students a closer look at the top accredited criminal justice institutions and training programs in the state. Completion of the criminal justice program at the College of Southern Idaho results in an associate of arts degree. Students will study the psychology of criminal behavior, investigative procedures and the structure of the justice system. Graduates will be prepared to enter the workforce in a variety of fields, including law enforcement, probation and parole, loss prevention and corrections. The program prepares students to work with both adults and juveniles. The college, and all of its degrees, is accredited by the Northwest Commission on Colleges and Universities. Prospective students are welcome to tour the school and speak with faculty before applying. Students who complete the criminal justice program at North Idaho College will receive an associate degree, and will have met the core requirements for all public universities across the state. Aside from fulfilling the first two years of a bachelor's degree, the program prepares students for immediate entry-level placement in the workforce. Student resources include career services, which offers a three-step framework for career selection and search. The College Skills Center provides resources to help students meet both their academic and personal goals. There are also computer labs, advising services, health and counseling services and a comprehensive library. The College of Western Idaho has a criminal justice program designed to immerse students in the field, including the basics of concepts like arrest and seizure, psychology and political science. Upon graduation, students will be prepared to enter federal law enforcement, victim services, court administration and related fields. The college stands out by inviting students to join the Criminal Justice Club, which offers guest speaker presentations, service learning, internships, community agency networking, field trips and career exploration. Students have access to advising services, both online and on campus, as well as career services, crisis counseling and help with transferring. Idaho State University offers an associate degree in criminology as well as a bachelor's in sociology with a concentration in criminology. First year students will take a class that prepares them to become a part of the university. The university promotes a healthy lifestyle by providing facilities for medical, dental, emotional, mental health, and fitness. Students can use the career center on campus to prepare themselves for jobs in criminal justice at the local, state, and federal levels through resume reviews and practice interviews. In person tutoring is available for free to all students at Idaho State University that covers all subject areas. The criminal justice program at Boise State University offers a bachelor's degree as well as a master's degree for those who are looking to further their studies. The university also offers some classes in the criminal justice program online through Blackboard, to help students maintain flexible schedules. There are student organizations and clubs available to get involved on campus and in the local community. Students can also use free tutoring services either in group settings, in private, or online to further their educational goals. The health services center on campus provides students with medical care, counseling services, and wellness services. After graduating from Northwest Nazarene University with a degree in criminal justice, students will be ready to pursue careers as attorneys, private investigators, and law enforcement. The Wellness Center on campus provides students with the means to promote a physically and mentally healthy lifestyle and wellness in the community. Students can use the Career Center as a resource to review resumes, practice interviews, and assist in the job search. The university provides tutoring services for students to help students achieve their academic goals. There are student run clubs and organizations available for students to get involved on campus and enhance their experience at Northwest Nazarene University. Through the criminal justice program at Lewis and Clark State college, students will be able to pursue career paths like law enforcement, private security, and attorneys. First year students are provided with a booklet to help guide them through the transition to college and what to expect. Students can join clubs and organizations ranging from accounting to geology to welding, to enhance their experience at Lewis and Clark. The health and wellness center provides a welcoming place for students to seek medical care and counseling and promote healthy lifestyles. For help searching for a job, writing a resume or interview practice, students can use the career center. To find the best-fitting program, it’s a good idea for students to research and compare academic options across the state. With the following tool, students can sort schools in Idaho by comparing factors such as cost of tuition, student population and acceptance rates. Explore criminal justice schools and programs in Iowa with the search tool below. Idaho’s criminal justice field includes a wide range of occupations, from law enforcement patrol officers to forensic scientists, judges and attorneys. The table below highlights some of the most common career paths for people who attend criminal justice school in Idaho. Click on the corner of each box to learn about each position in the state of Idaho, including employment and salary numbers. Students can also see what type of degree each of these criminal justice jobs requires to work in the state. As aspiring students choose a criminal justice school in Idaho, it may be helpful to look at how the state compares to the rest of the nation when it comes to criminal justice jobs after graduation. The graphs below detail job growth and salary stats for a variety of protective and legal service occupations in Idaho specifically, compared with the national averages for the same occupations. Students will also find more information on the degree level required to obtain these positions in Idaho specifically by scrolling over the colored bars. Just as criminal justice schools prepare Idaho students for work in many different fields, students can find work in criminal justice careers in many different areas of the state. It can be difficult for students to know which communities need the most help, while keeping their personal career goals in mind. The map below explores Idaho’s major cities and outlying regions that employ protective service and legal workers and how their wages vary by location so criminal justice school graduates can see where they can best apply their degree. This chapter of the ACC supports Idaho businesses by providing information on business practices such as contracts, crisis management, forms and policies and financial services. The ACC also hosts in-person and online training programs for in-house business attorney members. Along with other Chamber of Commerce organizations in Idaho, the BCC helps owners’ businesses succeed such by detailing information such as how to increase their visibility, engage with customers and network with other professionals in their area. This page acts as a resource for new and established businesses by providing information on compliance, forms, licensures and tools for successful businesses in Idaho. The Idaho Secretary of State, Business Entities provides lists of business forms, fees and online services for businesses in Idaho. Small business owners can use this website to find useful information about running a business such as employment guidelines, taxes and required licenses and permits. This Idaho branch of this national non-profit works with criminals re-entering society as well as people with mental illnesses in the justice system. They seek reduce spending in correctional facilities, instead reinvesting in strategies that decrease crime and strengthen communities. The IACIJA is comprised of a group of juvenile justice administrators from Idaho who seek to improve the juvenile justice system by providing resources and setting guidelines geared towards the well-being of juveniles. This organization also provides annual training conferences for correctional professionals. The IDJC promotes humane treatment for juvenile criminals and seeks to educate, rehabilitate and reintroduce juveniles into Idaho communities. This website provides resources for individuals and their families and employment opportunities for those interested in maintaining the safety and well-being of juveniles. This data resource provides public records of trial court cases in Idaho dating back to 1995 and is updated daily. This website provides information on court and judicial laws and regulations, lawyer resources, state agencies and other departments that may assist with legal education opportunities or other judicial system information in Idaho. Judicial professionals can find information such as code of conduct, annual reports and judicial career vacancies through the Idaho Judicial Council. A resource for finding Idaho’s city, district, appellate, and supreme courts, court records and personnel and job application information. The Fourth Judicial District Court of Idaho provides useful information for those interested in better understanding judicial and legal court processes, procedures and roles. The Idaho branch of the ACLU provides news and blogs on current events and local issues as well as information on how to get involved with local civil liberties cases. This society has information on military legal assistance and military-specific legal programs, pro bono work and lawyer referral programs in Idaho. The Idaho Legal Aid Services is a non-profit group that offers access to justice and other legal resources like emergency help and community services available for low-income people. The Idaho Law Foundation provides resources for attorneys and Idaho citizens about law related education, information and opportunities for career and volunteer service. Meeting roughly ten times per year, this commission addresses important criminal justice issues and challenges. They develop cost-effective solutions to promote a safer Idaho. This website provides Idaho citizens with important legal and government information along with helpful resources regarding issues such as concealed weapons, consumer protection, protecting seniors and fraud. The ICPA seeks to preserve safety and equality in Idaho by enforcing regulations and ensuring equal representation throughout the state. This website also provides information on job opening, vendor opportunities and conference dates and events. The Idaho POST promotes law enforcement and correctional proficiency by providing training academies, certification and in-service training and resources such as professional standards and forms and regulations. The Idaho State Police website provides information on law enforcement services, Idaho’s laws, local police divisions and employment. A professional standards organization for private investigators working in Idaho. They provide membership services as well as certifications. Because hunting and fishing licenses are regulated in Idaho, the state employs conservation officers to oversee the quality of wildlife in the state. They list employment and volunteer information along with other wildlife and environmental resources. This national organization hires employees and volunteers to help protect Idaho’s natural resources through conservation practices and wildlife education. The National Park Service employs rangers and other people interested in conserving national parks, and there are employment opportunities in Idaho’s national parks such as Yellowstone and Craters of the Moon. For over 75 years, the Idaho Wildlife Federation has been educating individuals on conservation and preservation strategies. This website has resources on education, employment, volunteer and legislative opportunities. Created in 2010, the ICLT works to preserve natural resources by community education and advocacy. This page has information on conservation, volunteer opportunities and donations.